Ann Dvorak: Hollywood’s Forgotten Rebel by Christina Rice is one of the finest books I have ever read. It's taken me a long time to sit down and write this review because frankly I've been intimidated by it. As a biography of an obscure figure from film history’s past, it’s a simply a masterpiece. From the brief preface you can already tell that the author has a passion for all things Ann Dvorak. Author Christina Rice’s reputation precedes her though and she is known among many classic film enthusiasts as the leading expert on Ann Dvorak. She runs AnnDvorak.com and in 2013 she did daily posts on Dvorak that lasted the entire year. Such an elusive and poorly known figure as Ann Dvorak was required someone with determination and passion to tell her story. There's no one else who could do it justice. Author Christina Rice puts together the puzzle of Dvorak's life so we can see the bigger picture, even though there are plenty of pieces missing. In other words, the author does a lot with a little. Children usually carry on the legacy of their parents. For those with fame and recognition, their name is held up by future generations who appreciate their work. Dvorak was childless and a forgotten figure of film history by the time she died in 1979. She was lost to us until the home video era and a resurgence in interest in Pre-Code films. Dvorak was rediscovered when so many of us fell in love with her via Three on a Match (1932) and Scarface (1932) among other films. Dvorak never became a big star but it wasn't for lack of charm or talent. She was rebellious against a studio system that often punished her with suspensions and lackluster roles. Even before Bette Davis and James Cagney, Dvorak stood up against Warner Bros. and the notorious Jack Warner. Dvorak went from child actress to dancer to supporting actress to lead actress, demonstrating along the way her capability to adapt and transform. But true stardom was not meant to be. Another reason for Dvorak's star's limited rise was because she always prioritized her romantic relationships over her acting career. She was especially invested her her first marriage to actor Leslie Fenton. Their honeymoon took her away from Hollywood for a year but she relished her time abroad. Fenton's influence can be seen in Dvorak's penchant for traveling, reading and even esoteric hobbies such as bacteriology. Dvorak was married three times and her last marriage to Nicholas Wade brought her to Hawaii where she would live out the rest of her days in relative obscurity. 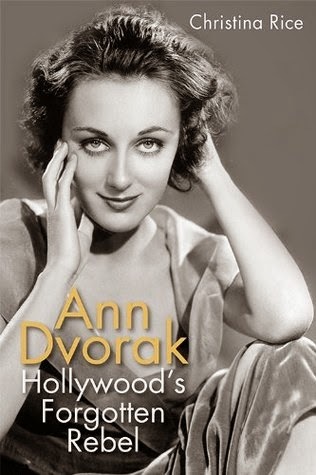 Rice's biography of Ann Dvorak is a wonderfully thorough look at the actress' life and career. Much time is spent on Dvorak's complicated relationship with her mother, who was also an actress and an intriguing figure in Dvorak's life. There are plenty of photos throughout the book and lots of detail about Dvorak's films as well as her TV and theater work. The book starts with a fascinating introduction which serves as a snapshot of Dvorak's life but also demonstrates the author's passion and tenacity for the project. I highly recommend this book to anyone. Classic film fans and Ann Dvorak admirers will appreciate it as a primary source. I also think readers who appreciate well-written biographies about interesting women of the past will find a lot to enjoy in this book. A big thank you to the University Press of Kentucky for sending me this book to review. I'm sure it's mentioned in the book that Ann Dvorak was assistant choreographer to Sammy Lee on many early MGM musicals. Their style may not be the most elegant but I love it nevertheless. I'm really glad you enjoyed this book as much as I did! It's a stunner (and so is Ann)! 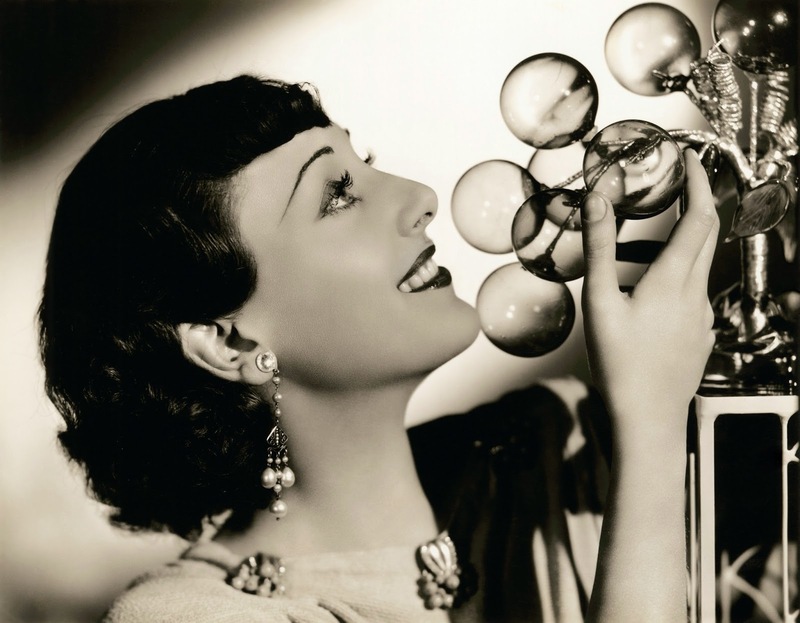 Gosh Ann Dvorak was such a beauty. I love the photo above. So Art Deco, so glam. I'm glad you enjoyed the book and I remember you giving it a stellar review.